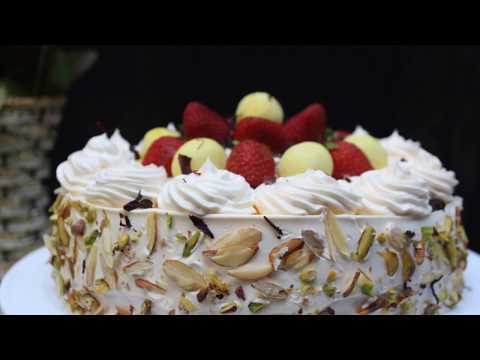 Rasmalai Cake is a fusion of classic Indian dessert with sponge cake. It tastes divine and an absolutely scrumptious. 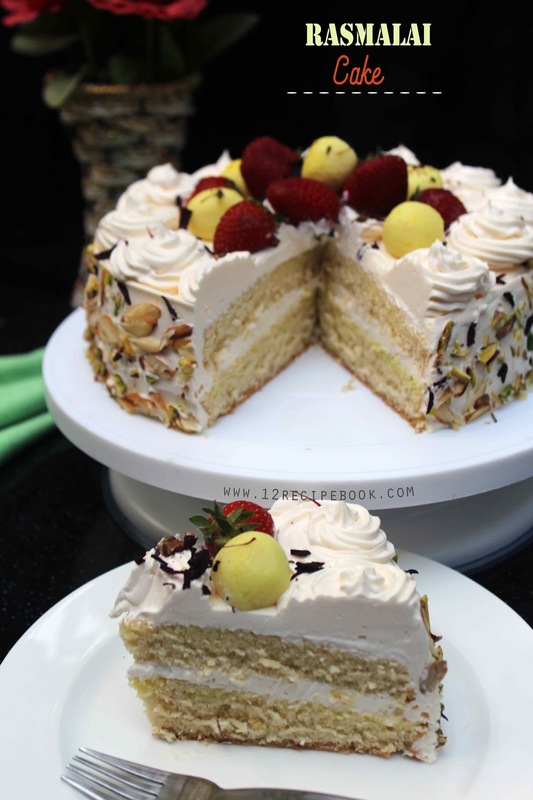 You can make your favorite sponge cake and whip it with rasmalai blend. It's worth trying the simple recipe and don't forget to leave your feed backs. Here i used store bought rasagulla and made a thin rabdi for it. Mix milk, vanilla essence and oil. In a large bowl add egg whites and vinegar; beat until triples the volume. Add powdered sugar little by little (in three additions) and beat until fluffy peaks are formed. Add egg yolk; take a hand beater and mix the egg yolk with batter gently without over mixing. When it is completely mixed; sift flour in to the batter by three additions; mix them gently. At last add milk mix and fold the batter slowly until mixed well. Pour this batter in to a lined 8 inch cake pan and bake in the pre-heated oven at 180 for 30-35 minutes or until top get's nice golden in shade. Allow the cake to cools down completely before whipping. Cut them in to two equal circles and keep aside. Beat the whip cream until fluffy and thick peaks are formed. Add saffron food color and almond essence; Beat again until mixed well. In a cake stand; at the middle add little whipped cream and place a slice of cake on top. Soak the cake evenly all over with the rabdi of rasmalai. Add a dollop of whip cream on top and level it. Add few pieces of thinly chopped rasmalai; Add another half of cake on top. 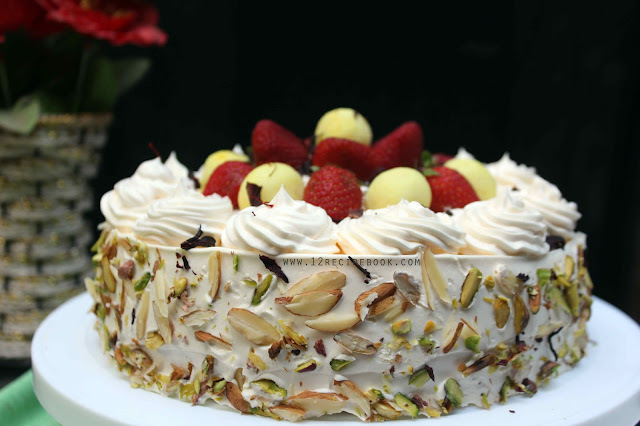 Soak it with rabdi and cover the cake all over with whip cream. Garnish the sides of the cake with sliced almonds and pistachio. 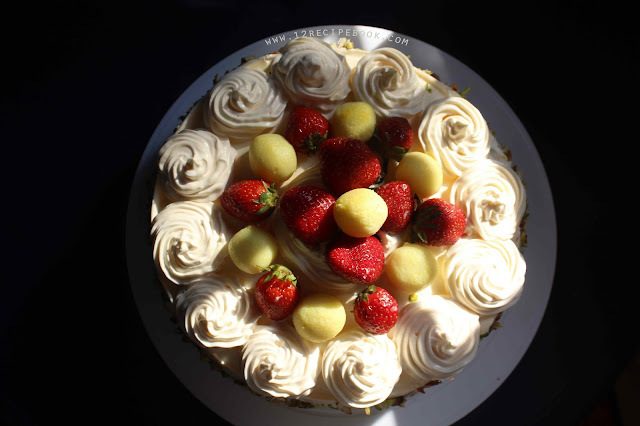 Garnish on top with peaks of whipped cream, fresh strawberries and rasmalai. Chill the cake for at least two hours.